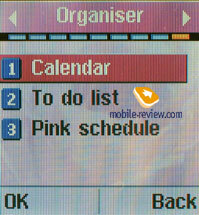 LG G1800 is obviously an example of the world division of labour and companies' specialisation in different fields. The device sold by the Korean company of LG is essentially created by the Taiwanese manufacturer Phoenix on basis of a chipset by Dart Technologies (also a novice in the phone market, still the world's leader in the province of DVD chipsets. At hardware level we can see a radio block by Panasonic and component parts by other manufacturers. 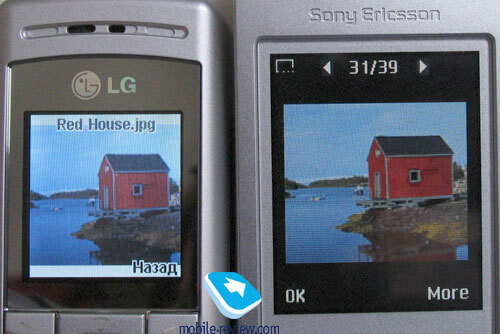 The same is true for many handsets represented on the market. The reviewed device is not virtually known alias its original title Phoenix, for the producer is too small and not noted beyond the bounds of Taiwan (still in the homeland it have no strong enough position). In connection with new positioning of the product series LG needed a successful model of the middle class which has no rival on the market. The model by Phoenix was picked out as the solution. It was gambled on reasoning from the presence of large memory capacity and MP3 playback. 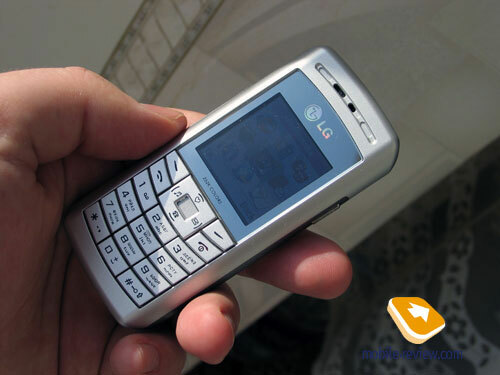 The device has no direct rival in its segment, since not a single model bears such functionality. 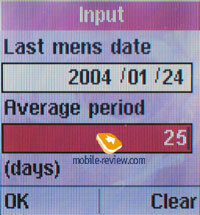 This fact makes LG G1800 deserve very close attention. The model is produced in the classical form factor and the dimension (99x45x17 mm) of the device is quite nice as it fits easily both jeans and shirt pocket. The weight (78 g) also does not exceed average measures of the class. 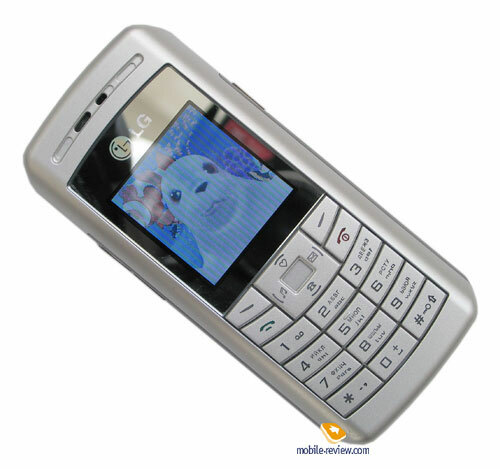 The assembling and design resembles in a sense those of Motorola C350. The similarity is more in ideas and there is no direct copying. When compare feelings about these models, one would mention the identity of the dimensions and comfort of carrying. The quality of the coating and the silvery dye is low and completely beneath criticism. If you use actively the device for two or three weeks, some abrasion will appear on the body's corners and sometimes side surfaces. The dye is not scratch-proof and the handset should be carried apart from any other things. 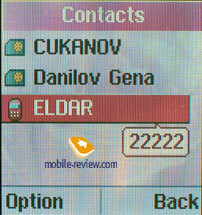 The manufacturer declares support of an STN screen showing 262K colours. It is significant that the resolution being close to the minimum and forming 128х128 pixels (27х29 mm, distorted geometry). 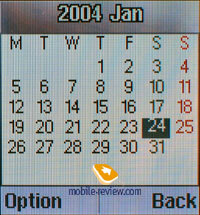 Yet I have failed in reminding at least a handset with an STN 262K screen. 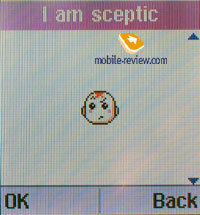 It implies by no means that such screens do not exist. If you glance at specifications of STN screens manufacturers, you will find many propositions of the corresponding characteristics. 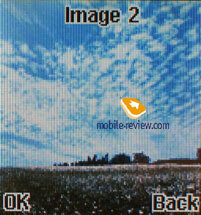 They are usually screens of higher resolution than that of LG G1800, still there are similar screens. The further examination displays that the producers who apply the similar STN matrixes do not announce of showing a larger amount of colours (65K is a standard). And where is a deception hidden? 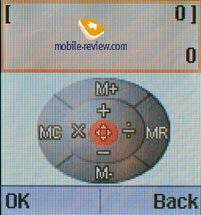 Showing of the proper number of colours is accounted for by a controller that presents in the device physically. 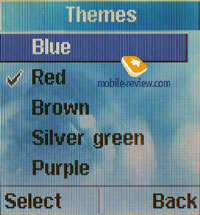 Besides a support of a controller, there is a need of using correctly a colour profile as it belongs to software. The chromacity of many prototypes, even commerce devices, does not differ from that of previous models owing to an incorrect profile realisation. 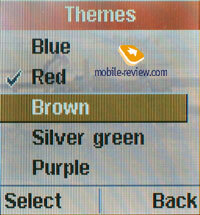 The handset's software cannot operate with the colour palette which includes a more quantity of hues. If both these constituents functions correctly, we should see what actually it allows us. 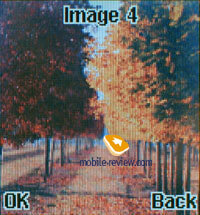 The switch from 65K to 262K entails a development of colour transition and the picture gets smoother. The switch to a new controller within one matrix also involves more image sharpness. Many manufacturers reserve purposely a safety factor of image enhancement and this enables to improve visually the quality of an image with no change of component parts. Everything above is true, to a big extend, of TFT, TFD, and OLED screens. The switch form 65K to 262K is apparent as concerned to STN and UFB matrixes. 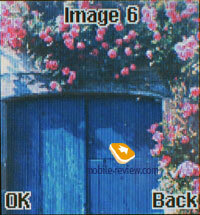 The image quality remains still. 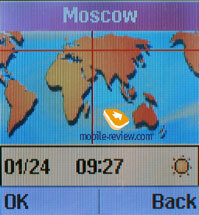 Colour transitions are shown better on screens of a high resolution and such transitions vanish on a small diagonal. There is a virtual situation that the grain size and STN restrictions do not permit showing the difference between 65K and 262K colours on mobile screens. 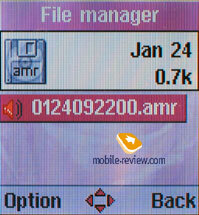 And from this it follows that none manufacturer declares a support of 262K colours on the STN screen. This palette support does not theoretically mean its realisation. 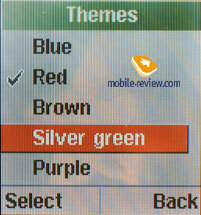 As with LG G1800, the stated number of colours is merely a marketing course. We cannot say the screen to compare to usual TFT matrixes showing 65K colours, for it is rather weaker and image is not so vivid. 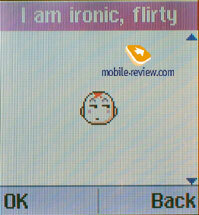 On the other hand, the screen is good for its class as being average in characteristics. The screen resembles that of Siemens C65 when confronted together. 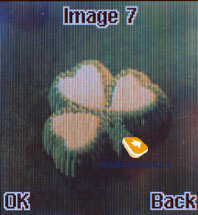 Subjectively, the image on C65 looks better owing to the grain size. The screen fades in the sunlight and gets hard to read. It fits 6 text and 2 service lines. The font is modest in size and seen well in any condition. 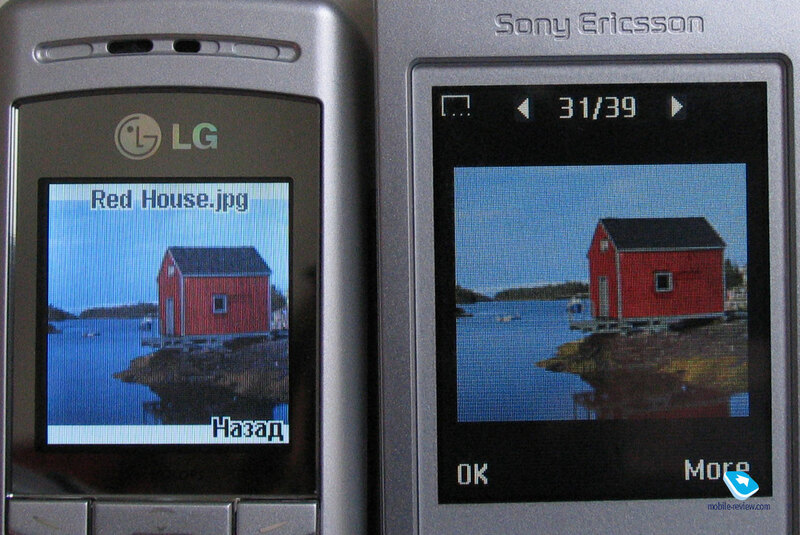 We may exemplify a photo on Sony Ericsson Z800's screen (QVGA resolution and the original picture is за a small resolution) and the same on LG G1800's screen. 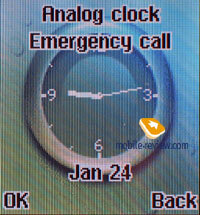 The example of Motorola E398 displays the same drawbacks. 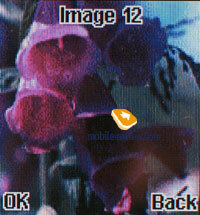 The contrast of LG G1800 screen corresponds the 11 point (default value, bigger values overbrighten and smaller values darken the image). 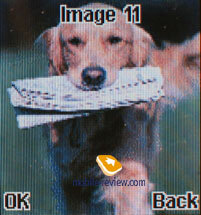 An image of bigger resolution is accessible by a link and you can watch detached points showing. 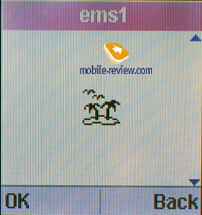 I should focus your attention on the fact LG G1800 lacks for yellow and a house reflecting in the water is absolutely lacking. 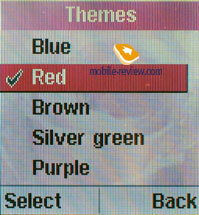 But we would not talk about single hues on LG G1800 screen. The keypad is made of plastic and the key block has a infirmity defect of fastening. And this implies all the keys' backlash: you would just pass over them with the least pressure and they begin move aside. The backlash leaves an impression of slovenliness of the assembling quality. Nevertheless you can rather get accustomed to it and the further operation the keypad is quite easier. The backlighting is white and characters are not seen under any condition (the localised version has two rows of small characters). Not everybody will relish the navi button as its size is quite modest. The OK button doest exist here. A service indicator is inserted into the button and twinkles with dazzling white. When the device lies next to you, such twinkle can rather irritate you, since one draws attention to the handset owing to the bright colour. 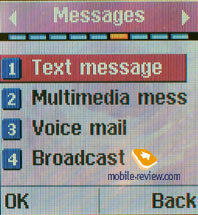 Video telling about the keypad backlash (avi, 3.11 MB). The left side surface has a coupled volume button. 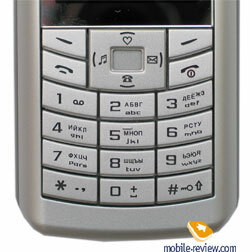 It is of high importance for the device with a MP3 player. 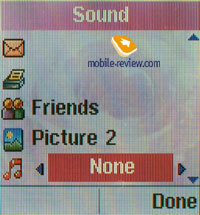 On the opposite side there is a button dedicated to the MP3 player and you can trigger this application with one pressing. The hardware raliasation of the MP3 player is very nice and compares in a way to that of Sony Ericsson K750 belonged to another class. Headphones are connected into a gap on the top. The kit has a headset which is not inserted receiving calls using it. 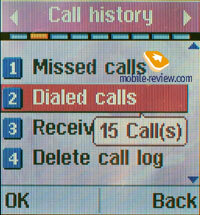 Not a single headset sampled by us does add such functionality to the handset as at a call you always have to take out the handset and receive a call with pressing a button. 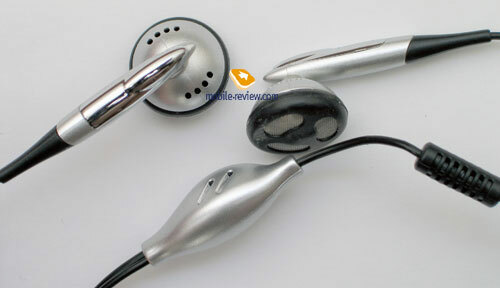 The standard stereo headset is average in quality and music is heard good at most. 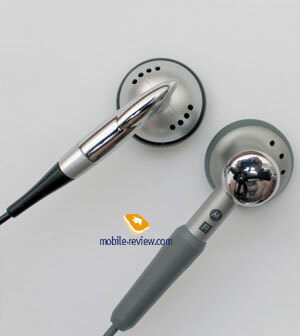 The headset of Motorola E398 sounds more qualitative and sound is smother with no strong overtone. I advice you to try the phone with headsets by extrinsic manufacturers, since founding them makes no trouble. The native headphones, though acceptable to an unpretending user, do not unveil the whole potential. The bottom has a miniUSB connector, there is no unusualness. A short cable to connect to PC is provided with the handset. Another cable can be sold in any computer shop for a couple dollars if necessary. 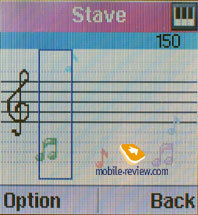 On the back side surface one can see a loudspeaker gap to reproduce ring tones and playback MP3 compositions. 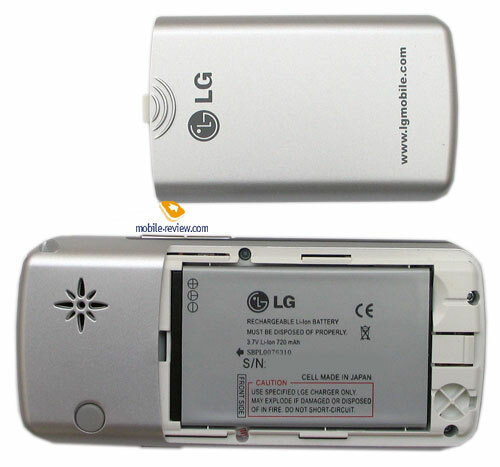 The back covering has a small backlash and hides a Li-Ion battery of the capacity of 720 mAh. 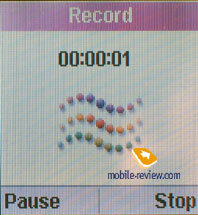 According to the manufacturer, the accumulator provides 3 hours in talk mode and up to 300 hours in standby mode. 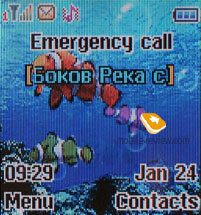 In the condition of Moscow MTS network the device has been working for 4 days in case of 30 minutes of talks and the minimum using of other functions. 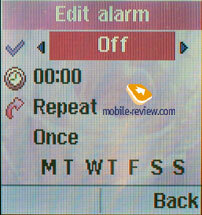 Listening to MP3 player for about 2 hours a day and the same time of talks reduce battery life to 2 days. Regarding that while USB communication the accumulator is being charged, everything will depend on whether you often copy new compositions to the phone. 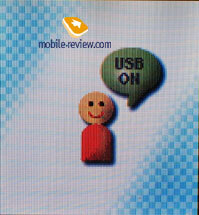 It is significant that while USB communication the device is turned off and you could not use it as a phone. Full charge takes a little more an hour and half. 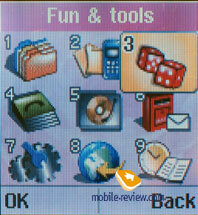 The main menu is called by pressing the left softkey and represented as a series of icons. 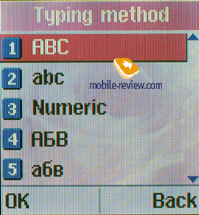 A shortcut number navigation operates with a number sequence, still it is partially realised. 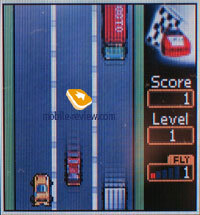 A pressure of a number in the main menu results in switching to the corresponding item, but at the second level a pressure of a number does not select an item, but backlights it though. I do not presume to judge how much this realisation is more comfortable. To my mind, it is partial. 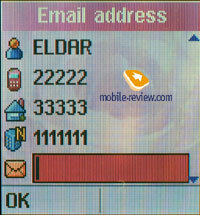 The navi button is assigned to exactly determined functions - contacts, messages, melodies, and selected. You can add your own functions to the list Selected. On the whole, considering a little number of functions, calling them does not pose problems and, the main thing, the MP3 player has its determined button. 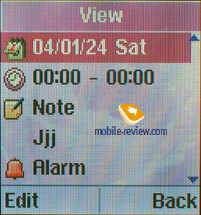 The device's localisation is carried out traditionally to the company of LG and you should not expect adjusted translations, but one will soon understand what it is all about. The font size is larger than average. Most titles do not fit the screen and start scrolling. Phone book. 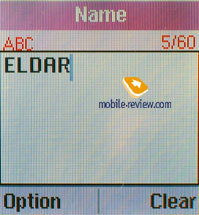 The phone memory holds up to 300 names and an entry could have the following fields - name (29 characters), three different phone numbers, fax, and e-mail. 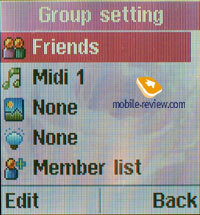 Either name is also adjusted to one of 5 caller groups, a melody and an image (only preinstalled ones). 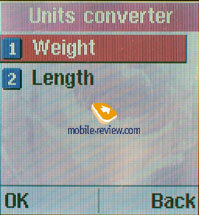 The handset support data transmission to a SIM card and back. 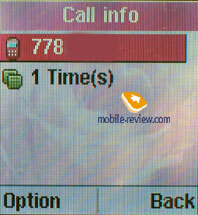 The total list shows numbers both from SIM card and device memory. 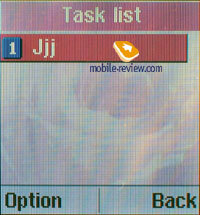 A fast-access retrieval in the list runs only in English and is fundamentally lacking in Russian. A full text search proposes the alternative. In the settings you can select the fields to fill up originally. 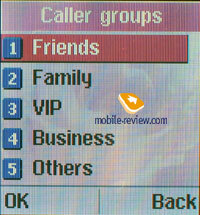 There is an image and ring tone choice for a group. 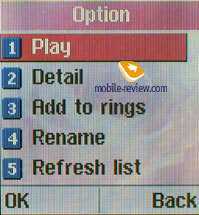 Each MP3 melody from the device memory can serve as a ring tone and for that you should select the corresponding item in the player menu. Unfortunately, these melodies are restricted to 5. This applies to both caller groups and phone entries. Messages. 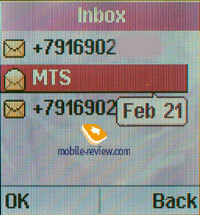 In the settings you should choose the memory which is allocated to hold messages by default. 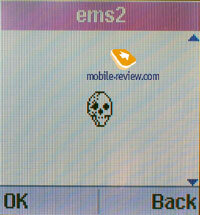 The phone supports EMS standard and creating concatenated messages. There is no unusualness. 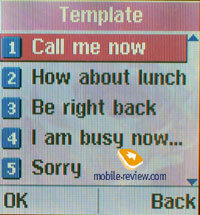 The device has 10 templates preinstalled. 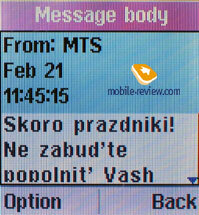 Operating MMS messages presents no difficulty and everything is rather customary. 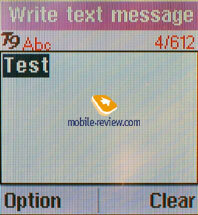 Text can be entered either by letters or with T9 using. Organizer. The calendar shows a month. 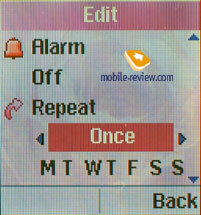 Events may be recurrent and you are to select necessary days of week at that. All events can be displayed in a separate list. 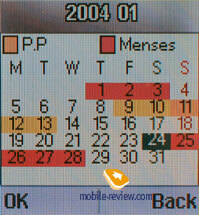 The handset provides a menstrual period calculator. Evidently the Korean companies start to add this function to various devices, including those intended not merely for women. WAP. 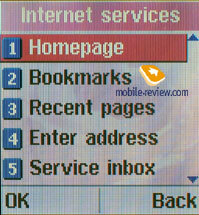 The model has a wap browser of 1.2.1 version preinstalled that has no peculiarity. 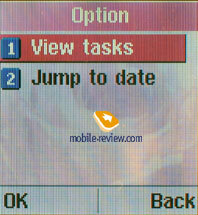 A batch communication is supported and this makes browsing an inexpensive action. Profiles. 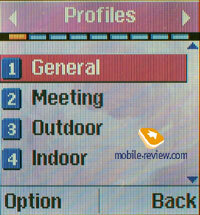 The device has several profiles and for each you can choose a mode and a ring tone. 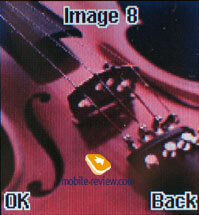 Still you could not assign a melody to messages, but there are only 8 preinstalled melodies. A vibracall may run either after a call or concurrently with it. Call lists. Each of three lists holds up to 15 entries, yet time and date of a call do not indicate. 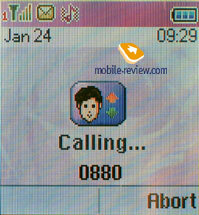 It is interesting that when viewing a caller enlisted in the phone book a user see the phone number in a pop-up window. 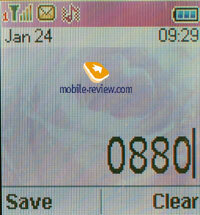 The handset has a message counter that is quite uncommon. Games and applications. The model has three games. 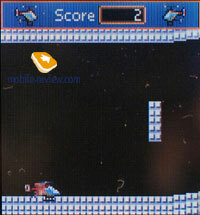 They are race, snake, and helicopter. 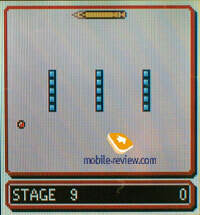 The games are ordinary and draw no special interest, although they are entirely adequate to the aim audience. 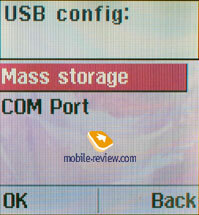 The file manager permits you to review the memory contents and see the capacity of spare memory. You also have an opportunity of creating your folders. 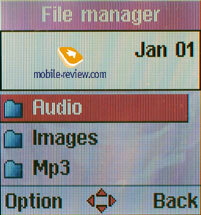 The functions of the file manger are quite simple and have no special features. Files can be deleted as well. Operating the memory is more comfortable with a PC using and moreover you will hardly need to operate the memory on the phone. 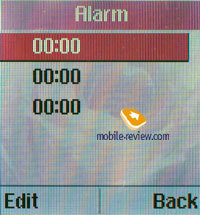 There are 3 alarm clocks in the phone, each one can alert once, daily or weekly. 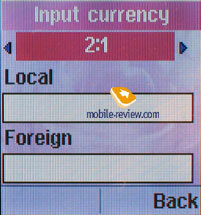 Calculator, unit converter, currency convector, and world time function are quite usual. 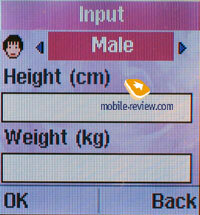 Besides, there is calculating a body mass. Settings. There is a manual frequency selection, including 1900. Here you could turn on a keypad auto lock. 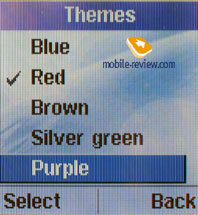 Themes hide mere colour decoration of the menu. The choice of wallpapers is not so broad, though suffices. Other settings are actually lacking and we have nothing to review. Multimedia. There presents a melody editor. It is naturally not polyphonic, but ordinary. Regarding a support of MP3, you would not write your melodies. Unfortunately, all the 20 preinstalled melodies are in the format of midi and they sound rather poor. The dictaphone permits recording either AMR or wav files and the records could serve as ring tones. 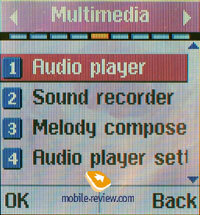 The MP3 player is possible both by pressing the button and in the menu. Its realisation is of the greatest interest in this device. 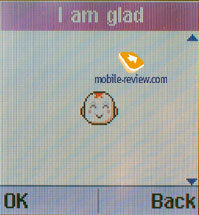 It is much better than the other functions of the handset. 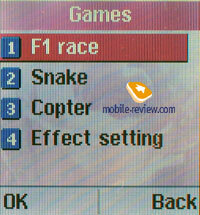 For instance, the player runs in standby mode and you may use other functions. The possible of such work is selected in the menu. The side button starts or pauses a playback. The playback list is rather simpler to form on a PC. It is the player's simplicity that constitutes the advantage of the model and the player is very comfortable to use. 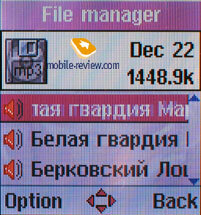 It supports ID3 tags, including in Russian. Melody reproducing runs with either a headset or a loudspeaker. The volume of polyphony alarm is modest and, as for the preinstalled melodies, the sounds at average level. The manufacturer declares the presence of 64-tones polyphony, yet the quality of the preinstalled midi files is so that they can be hardly called 16-tones ones. Still you could make sure with listening to sample melodies in the end of the review. In most cases you should use MP3 melodies. This is the best way and the handset is better to hear. 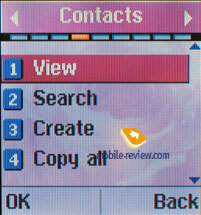 The restriction of melodies accessible as ring tones does not permit assigning personal melodies to a large amount of entries of the phone book. A vibracall is modest in power. You will feel it through your clothes by all means, but can miss, if the device lies in a may pocket. The phone has no troubles in connection. The loudspeaker volume suffices in the most of cases, although extrinsic noises are sometimes to be heard. The quality of talk transmission is quite good for a device of such class. Operating a flash memory would satisfy almost all as everything is entirely clear. 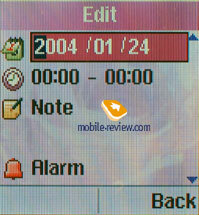 The memory capacity totals 64 Mb and the fact that the device could be used as a flash memory form an advantage. 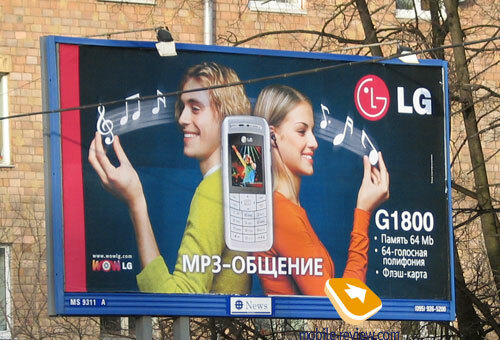 The MP3 player realization is rather good, nevertheless one should change the standard headphones. The models have no rivals in the class by these two features and not a single similar product has entered the market. Unfortunately, the realization of the rest functions is not worth praising, since it is poor and full of many restrictions. The quality of the plastic is beyond criticism. And the lack of Java is to be considered as a grave drawback. 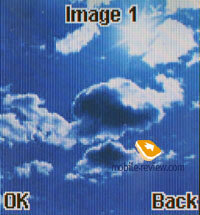 The model LG G1800 should be advised those who lack a player and a phone, but is restricted within money. This user feels no need of any additional functions and is ready to bear with the plastic quality and some function realization. In general, this is a low-end model which exceeds in quality typical to models of the third order. The cost of the model totals 150 USD approximately and that compares to models of the medium level with much better functionality, for example, Siemens C65, Motorola C650. For this money you can acquire a qualitative MP3 player with memory of 256 Mb, an FM radio with all functions realization of the best quality. So it follows that a purchase of separate devices is a more profitable way. 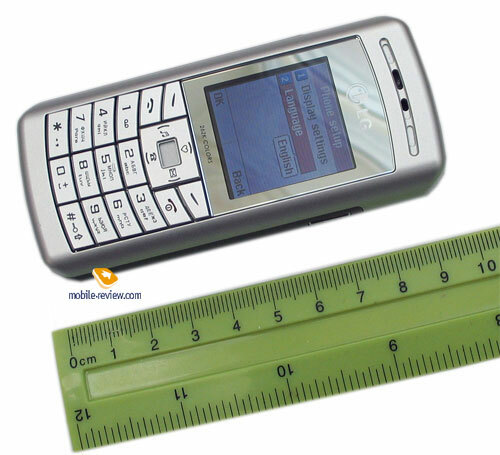 On the contrast, the very Motorola E398 costs just 75-80 USD more, still offers a higher level of quality and functionality. By this example one can see how the company of LG treats the customer. The advertisement of the model that is to be found on the streets of cities runs as follows the model having memory of 64 Mb and a flash card. Still it is a secret where the device has got a flash card. It is interesting that in case of an unfair advertisement the company has a chance to confront with Moscow Association of Businessmen, for the advertisement is being placed for about several months. Also the number of showing colours is to be regarded as a statement of the same kind. P.S. Those who like to make an experiment and enhance the call volume of MP3 melodies should turn to the engineering menu. The menu is entered by pressing the sequence *#3646633#, then you should select the division Audio, Headset, Mode, Melody. 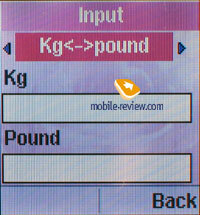 The volume consists of 6 points, the maximum one equals 255 (146 by default). After you changing some values, the loudspeaker may come in bad order at some melodies and so you are to make any changing deliberately.